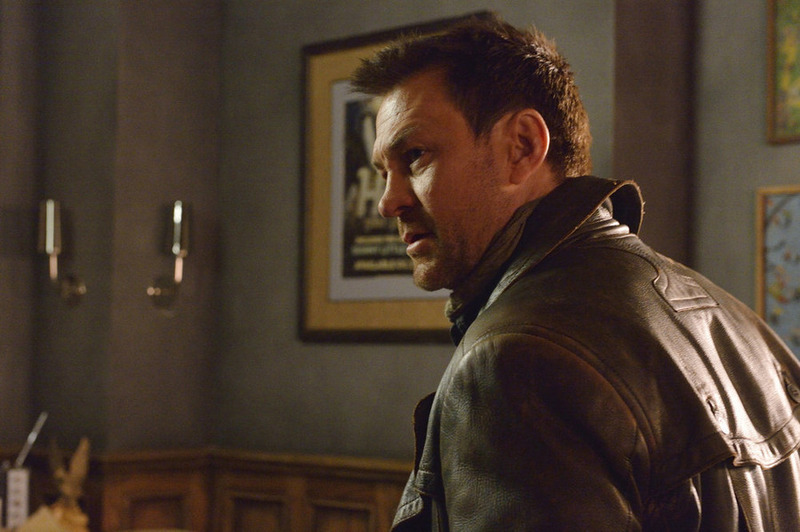 Defiance kicked off its third season with some pretty shocking twists and turns. OHSOGRAY recently joined a press call with Grant Bowler (“Nolan”) to talk about what’s ahead for the law keeper in the unlucky town. Defiance airs Fridays at 8/7c on Syfy. Can you talk about Nolan’s journey this season? We’ve obviously established Defiance as not only an incredibly dangerous place to live which, […] but also the tenants [have] always been on the verge of disaster or boom or collapse, that really reminds me of California in the gold rush and somewhat defined. My character of the season is fabulous. It’s – I’m really, really happy and grateful for what Kevin got me to do this year. Because he’s much more about a story of what’s going on for him in Season 3 than he is about chasing around other people story, which by and large, he was doing in one and two. Defiance […] at the beginning of Season 3 is a shell of what it was. So basically, when Irisa set off and destroyed New York, a new element was created called gulanite. Gulanite is a rock that so hard that no earth-created machinery can penetrate it. Defiance now sits on this cap, this impenentrable cap, which means the town can’t get gulanite, which means that they can’t [support] themselves. The byproduct of that, of course, is Nolan and Irisa trapped under the gulanite, and I’ll say they’re kind of stuck. That’s the backstory going in. That’s the starting point and the reason why they’ve been trapped in that sleep for so long. This season is very much about getting the town back on its street; but as always, very much about town survival. I think the town in Season 3, thanks to Rahm Tak is in more peril and actually comes in a more direct attack and direct fight than it ever has before. Defiance actually gets successfully infiltrated in Season 3 by the enemy force, and directly assaulted. So it’s a much more perilous place to live. It’s on its last leg. There’s no energy; they’re lines for food. There are very little good[s] sold. If you look closely in the first few episodes you see that the markets is now moved inside, there’s no outdoor markets anymore because there’s so little to be gained and traded. So Defiance – yes, it’s a much [different] place. A bit Soviet Russia in the 1960s. Nolan [and] Amanda have some very strange bedfellows [and], again, have to come together in order to put the place back on its feet. What kind of action scenes have you had this year? My guy has been – I don’t think I’ve ever seen him that bloody and bruised. We’ve actually had – our only problem with continuity this season is healing my face up fast enough before the next assault on my fight, but I get messed up again. At one point, I think in…it’s in the second or third last block…I’m carrying injuries over from about seven episodes and my face is just hamburger. It’s not very glamorous to be me this season. But it’s been fantastic to play because it’s been a low, rough and tumbled. It’s been a lot of really good direct confrontation scenes to play a little high-stake drama going on. So yes, it’s been wonderful. I always wake up sore for about a month after though, you know. I think July I’ll be in bed. What’s Nolan’s mental state this season? This season has been fantastic for Nolan. He’s vulnerable for a start. I’ve really enjoyed that. He’s falling down this season. He has some challenges and he comes apart it seems a couple of times. We’ve always dealt with Nolan that’s so pragmatic, so full with fighting that he just tends to swallow his blood. There’s a great old expression, swallow your blood – old boxing expression. I think it comes from those great 1930s heavyweight champs. He’s always kind of been very much about that—swallowing his blood and moving on. This season, it catches up with him. This season, he doesn’t have another step in it. That’s been great to play. It’s been great to see in the character too because it really grounds in human as it is for me. The other big development in Nolan this season is through that vulnerability, through that – not being able to cope with everything, and through his own challenge this season, his relationship with the risk of changes. That is just awesome this season. I can’t say how happy I am to have this season with Stephanie. The relationship is fantastic. It’s always been my favorite part of the show. It becomes so much more full because she’s now in a position where she is picking him back up, where she’s supporting him, where she’s trying to figure out what’s going on with him. And they have to, having an adult-daughter relationship where it’s really complex, and it requires compassion on both front, and requires a lot of pressure and understanding from both of them. They get sorely challenged. Their entire history, the – all of his memories about her and bringing her up, [are] directly challenged this season. He finds out that the way he parented her or what he thought was the way he parented her wasn’t even close to her experience of what went on. So yes, it’s wonderful in those ways. Are there new faces on Defiance this year? Absolutely. We’ve got three major new players. We have Rahm Tak, who we meet in the opening stanza. He’s a warlord, if you like, for the Votanis Collective. And you know, Irisa destroyed the Earth Republic who were the balancing force to the Votanis Collective. Our big threat in Season 3 initially is that this military force of alien-based races, was moving north from South America. Rahm Tak is the advance guard of that Votanis Collective. [A]ll he wants to do is raise Defiance, burn it to the ground, and kill every single human being in it. So he’s our first player. And Lee, who played him, did an amazing job. Lee Tergesen, he did an amazing job of playing him with an enormous amount of flare and humor. He’s a genuinely frightening character. Then we come to the other two major new arrivals, who are the Omec. Now, we established in Season 1 that there were seven races of Votan, we only saw six of them. In Season 2, we saw the Gulanee, which we thought was the last race of aliens. They were an energy-based life forms. So that’s why we haven’t seen them before. At the beginning of Season 3, we discovered that there is an eighth race that predated all of the other races called the Omec. The reason we never heard about them before was that the Votan, the aliens who came Earth saying that they just wanted to immigrate and peaceful, had deliberately left this race behind. They sabotaged their ships. They destroyed their means of escape, and their rocks, and they left them behind to die. It’s basically the Votan shame and guilt the reason that humans have never heard of this race before. Our first double episode, the Omec arrive, the father and daughter, T’evgin and Kindzi, played by Nichole Galicia and Conrad Coates. They arrive right at the beginning. Although they don’t seem to have a problem with humans, boy they’ve got pay back to deliver to the aliens. You know what’s nice thing about that kind of split, Rahm Tak want us to kill every human being in Defiance. He’s on the outskirts and coming. In the first episode, right smack in the middle of town arrived these two aliens and they don’t care about the humans. They want to kill every single alien on the planet. […] You’ve got these wonderful two kinds of groups, if you like, of enemies – one hate the humans and one hates the aliens. So it’s an interesting dynamic. What have you learned in the last couple of years from playing Nolan? That’s a great question. It’s a question I’ll probably best answer in five years’ time, lasting what it is. But it’s taught me to be a better father to my daughter in a strange way. That would probably be the biggest thing. Playing that role and that twisted crazy father-daughter relationship is so amazing. It always brings me back to I have to kind—I have to look at my relationship with my kids, I have to look at my relationship with my daughter in order to find material, if you like, to mind, to play the same. I’m constantly talking over my relationship with my children on my head, and my relationship with my daughter in particular and examining my own strengths and weaknesses, where I’m like him, where I’m not like him, what I do well and what I don’t do well. I don’t know if I would have done that much examination. In the way I have, in the objective way I have, had I not been playing Nolan? So that’s probably the first biggest thing. The second thing is has been leading a cast. You know, and kind of having to be on deck in a production like Defiance is extremely complex and large every…pretty much every shoot day and try, some of the best of my ability to lead from the front. That’s been a growth for me. And something I really loved, something I really, really, really have enjoyed. It has been very fulfilling for me personally. Does the show feel more like a western or a sci-fi show to you? Well, it always looks really science fiction to me. They’re all running around and there are aliens…. But I do get what you mean. And do you mean what I think it is? I think all of our – I think our story is sci-fi but our archetypes are western. So you know, with all these incredibly technological stories, with all these, you know, pure science fiction stories about, you know, uptick and you know, and artificial intelligence, and you know, and faster than light travel, and everything else like that. But we have a mayor, a law keeper, and doctor, and our archetypes within that town, even the fact that it is a small town isolated in the wilderness, all those mains if you like, all those overwriting archetype are western, the same. So I think that’s where that comes from. I think you never get quite – you can never get too far away from it when you know, my guys, the law keeper and the doctor is the doctor, and the mayor is the mayor. But having said that, there’s an ease to archetypes, I think allows us to shorthand a lot of stuff story-wise, which means that we can get into the – get into the meat of what we’re trying to do, do story-wise much more quickly. That’s where genre really is strong; where it’s very, very useful is you can assume a lot of things based on the genre as an audience, and get into a story faster without having to establish so much. Going into a second season, there’s an excitement for having been renewed What’s the feeling like going into a third season? Like an old man. No, it’s fantastic. I mean, it’s an interesting landscape television today, isn’t it? It’s hard enough for shows to get a pilot, let alone get a runoff of pilot. It used to be that if you shoot a pilot, you had a fair chance to the season. And it used to be that if you got one you’d be supported and develop three, two or three. So it’s a more parallel universe I think that we all exist in—storytellers today. Every season that you get granted, if you like by the gods, is a sign of life. And having that third season is wonderful. I think for me, the first season of anything, and I’ve done a number of shows in a number of countries over the years and what binds it all together in the first season is your big idea. You run out your big idea and you see if it grabs and it gets any traction if people identified with it. The second season is everyone’s ideas. I like to call second season everyone’s best ideas, what everybody would have done if they could have run the universe in Season 1. And I think pretty much every show does that; second season is everyone’s idea. For me, the sweet spot for nearly everything I’ve ever been in is the third season. So – and I feel very much that about Defiance. This is by far the best show we’ve delivered. And I’m extremely proud of this season and show. I think the show grows up in its third season. It figures out – it shows why they make it to a third season and does that or it doesn’t survive. What happened with our show is that – what excited me most go into the third season was that we figured out what we are, and what we do well, when we’re on point, when we’re not, and how we best tell stories given the creature that we are. And I confirm with absolute confidence that we delivered on that. This is the best version of Defiance we’ve presented. So that would be the most exciting thing about Season 3. Winter, the coldest February in recorded weather history in Toronto was not the things, trying to say enough, that I was most excited about, given the fact that nobody gave me gloves or hats to wear. But yes, the show looks fantastic even for that, even in things that we’re working against this in Season 3, which was the weather and the conditions, make the show look even better on screen. So I’m even, in the end, happy with that. Do you feel like there’s a level of comfort now that you’ve been with the same people for so long? Yes. You form a family. You know, cast, like anything else, it’s like any relationship. First you fall in love with each other, and it’s all about potential. And the second year, you kind of look at each other and go, “Who did I wake up next to?” And the third year, you know each other. The third season is so wonderful because we’ll all have been around each other for a long time now. We know how to work with one another. We have real friendships based on lengthy experience of one another, which is really, really good when you got to work everyday. We’re very lucky on this show because we have a group of just really good human beings to work with. What inspires the people’s loyalty to Defiance the town? I think it’s – I think the answer to that lies in the world, which is if you move away and you build something else, then people are just going to want to take that away. Defiance for me, when we’re at our best, is very much a metaphor for the western world. You build something and it’s good enough—what’s Field of Dreams? If you build it and he will come? In modern civilization, if you build something nice enough, people will come and they want it. They’ll try and take it away from you. It may as well just be Defiance. I think that’s that. There’s also the name in the town that this place is built in defiance of those that want to pull it down. And defiance of giving up and is partly at least in testament to that spirit that brings people together to improve these circumstances—to put the world back together again. That’s human nature in essence. We came back from the Dark Ages. We rebuild around the world after two world wars. Human beings – New York, look at New York. I’m in New York City right now, and you know, I look at New York after 9/11. We have a great ability to come back. And I think that’s the spirit of Defiance. And I think that’s what Nolan recognized when he turned up in that place, that these people are – they might not have been as hot as he had been from the world he’d experienced but they had a lot of guts and they deserve a chance. I think that’s what still keeps him there, that he actually is grown to have a little respect and admiration and love for the town and the people in it. What role does Nolan have with the Omec and other alien groups? Is he going to play the peacemaker? You know, that’s like putting a pig in a soup, isn’t it? What’s wonderful about Season 3 to me is all of the protagonists that are coming into the show this year, you can reach out and touch. They’re individuals and they have therefore individual needs but also individual strengths and weaknesses. Rahm Tak is a megalomaniac and is quite insane, you know. But he’s incredibly effective…. The Omec are very old powerful strong race but their hubris…they’re arrogant, the fact that they see every other race as literally a lesser race, that’s the term for them, is probably their wrongdoing. I don’t know whether Nolan this season is much going to play as peacemaker as he is going to play politician. The key to staying alive longer than everybody else in Defiance sometimes I think is giving everyone enough of what they want to keep the whole ball rolling. With the Omec, they’ve a very dangerous proposition. They – we will see as the season goes along that they are very, very powerful creatures. We’re not actually quite sure whether we could get rid of them if we want to. In what ways do you differ from Nolan? I stayed in school longer. There’s just this line in Season 2 when (Panjit) talks about, you know, things at highschool, and he’s like a highschool crush and Nolan said he never went to highschool because the war broke out. And yes, I honestly think that’s got something with it. He – you know, he is more pragmatic than me. I am less self-assured, I think. And I question myself a lot more than Nolan does. Sometimes I envy him. It’s funny sometimes you’re doing the character set. He’s much more unequivocal than I am. I’m probably a little better at using honey to catch bears than Nolan is. Nolan would probably just fight them. I always like to think of Nolan as me with too much coffee and my impulse control removed. Is there something special people can look forward to this season? A particular scene, perhaps? It’s not the scene as much as an entire episode. There’s an entire episode where – let me figure out how to phrase this, where Nolan and Irisa get to re-experience their relationship, literally re-experience their relationship with one another. That relationship gets turned completely on its head, and I not only love what goes on in those scenes, all of them are great scenes for us to play. But I love the story line and the episode as a whole. I think – yes, to times of like being a parent or being a child or – I think in that sense, they’re really interesting questions that come up, you know, what – how much is perspective in the relationship and how people have different perspective to that same relationship. I also think from sci-fi point-of-view, from a television point-of-view, it’s a really intriguing story element that was written by Kevin. It’s a fantastic. So yes. You’ll know it when you get to it. But it’s – yes. It’s that episode when Nolan and Irisa have to go back and confront their relationships. It’s cool. I love that.